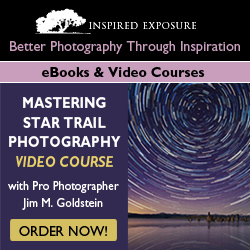 Are you interested in learning about star trail photography? Then you might want to check out Jim Goldstein’s 4 day online class starting on March 26th. You can sign up for the FREE live webinar and also purchase the video by following this link. Jim will cover everything you will need to know starting with what gear to use, the shoot itself, post-production, including blending, stacking and masking. If you purchase the video, Jim will also include his fabulous eBook “Photographing the 4th Dimension – Time” for free. The video will be available for pre-purchase at a 25% discount for $ 74.00. Starting March 26th it will be available for $ 99.99. Those who pre-purchase the video by March 25th will also be entered to win a free copy of Adobe Photoshop Extended (a $999 value! ).